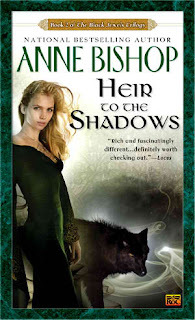 Heir to the Shadows is the 2nd book in the Black Jewels series by the award-winning Anne Bishop. Bishop is also the author of the Tir Alainn and Ephemera series. Picking right up where we left off in Daughter of the Blood, the Realms' Witch - Jaenelle Angelline - awakens from her deep slumber more powerful than ever. With her dearest friends and guardians by her side, Jaenelle works on strengthening her powers and helping those in need throughout the Realms - including kindred in the form of wolves and unicorns. However, although Jaenelle is awake and very strong, her amnesia prevents her from remembering Daemon - and the rest of her childhood. Driven mad as a result of thinking he has killed Jaenelle, Daemon stays hidden in "The Twisted Kingdom" as he suffers. As months, then years, pass, Jaenelle gradually builds a loyal court that includes her friends, adopted family, and Lucivar, Daemon's brother. Heir to the Shadows definitely stands up stronger and prouder than its predecessor, Daughter of the Blood. After all, we're already familiar with the cast of characters, and our bond with them grows infinitely stronger in this sequel. While Daemon's character is shoved to the wayside in Heir to the Shadows, we are treated to more of Lucivar's character, who was more or less neglected in Daughter of the Blood. While Jaenelle has more of a romantic relationship with Daemon, she appears to have a very friendly and sibling-like relationship with Lucivar. In addition to the novel's plot, Jaenelle's sexuality also strengthens throughout Heir to the Shadows, especially as she turns 17 a little more than halfway through the book. While the first portion of the novel drags just a tad slowly as Bishop brings us up to speed with Realm politics and Jaenelle's awakening, the pace picks up as soon as we reach Part III. The rest of Heir to the Shadows will just fly by, and soon you'll be eager to buy Queen of the Darkness, which is the third book in the series. My favorite part of Heir to the Shadows is when we are regaled with the history of the Blood Jewels and caste system during a conversation between Saetan and Titian. Bishop has truly created one of the most fascinating and creative fantasy stories I've ever read. If you enjoyed Daughter of the Blood, then you'll love Heir to the Shadows even more. Readers who have not read Daughter of the Blood will most likely become lost while reading Heir to the Shadows, and may not appreciate the story as a result. I've already got Queen of the Darkness on standby, and I'm very excited to read it! The next books in the Black Jewels series are Queen of the Darkness (1999), The Invisible Ring (2000), Dreams Made Flesh (2005), and Tangled Webs (2008). Click on the images of the books below to review them in more detail on Amazon.com. What is your favorite Anne Bishop novel? Share some of your favorite fantasy novels with us in the comments section below. What a cool analysis and review. I love this series so much so far. I just finished this Heir to the Shadows and want to read the next book now.